Jon is a highly skilled and experienced professional. He is very thorough and detailed and this is clearly evident in the high quality of his deliverables. He has garnered a strong skill set from working several years in the industry and he brings this to bear with good positive effect on his tasks. He definitely adds the extra factor to any team he is a part of. Jon is an avid team player, sociable and well liked and respected by all. He operates at a high level of integrity and is of good upstanding character. I recommend him very strongly for senior leadership roles in high performing organisations. Jon has been an integral member of the team and has proven himself time and again to be indispensable. His professional approach and his work ethic are exemplary. Like most of the management team I have come to rely on his expertise and knowledge on a daily basis, and Jon’s desk is usually the first place to go when there is a problem that needs fixing! His ability to provide a technical solution to a business problem without losing sight of the business requirements sets him apart from many of his peers. I would choose to have Jon on my team for any and all future projects where possible. I have had the pleasure of working with Jon now on two occasions. Jon is a very well respected technical architect who can apply his in depth technical knowledge to minor technical issues right through to detailed technical design. Whilst at the top of his profession technically, Jon has the ability to step out from technology and understand the MI requirements of senior stakeholders. Jon is a world class technical architect in his field and I would strongly recommend him for anything he wishes to apply himself to. Jon is one of the most professional infrastructure engineers I have ever worked with. With broad experience in all operational and technical matters and with his exceptional expertise in VMware he has made significant improvements to our international Windows platform. Jon is an excellent Windows Server and VMware enterprise administrator and engineer. His particular expertise in automation and scripting via PowerShell and PowerCLI are built on great depth of knowledge, understanding and experience of both platforms. His dedication to the task in hand and improving his knowledge is exemplary. He would be a valuable asset to any technical infrastructure team. I have had the privilege of working with Jon over the past 9 years, during this time I have relied on his strong technical knowledge and his ability to troubleshoot and resolve issues quickly. Jon has always been professional, hard working and proved to be someone who can be depended on. He is able to communicate clearly with both technical and business users and has an easy going personality which will make him a good fit in any team. It has been a great pleasure for me to work with Jon on virtualization security topics. His open minded approach made it easy to discuss and resolve topics where security guidelines conflicted with operational procedures. Our collaboration led to the successful implementing of technical solutions to ensure full compliance within the infrastructure. 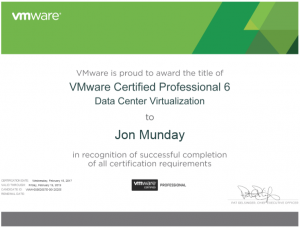 Jon has an excellent understanding of datacenter virtualisation and enterprise operations where this knowledge is supported by professional certifications, including being honoured as a vExpert. Working with Jon has been a pleasure in all cases and I consider him a very valuable colleague. Having worked alongside Jon I can highly recommend both his work ethic and technical ability. He is very knowledgeable on a wide variety of IT skills, especially VMware. In my opinion Jon would enhance any IT team he joined and I would welcome the chance to work with him again in the future. Jon is one of the hardest working individuals I have met. He has a fantastic depth of technical knowledge, giving him an enviable ability to troubleshoot and resolve issues. He does this with a thoroughness and attention to detail that has earned him the respect of many people in the company. Jon recently has been primarily responsible for VMware in London and has been instrumental in driving this virtualization technology forward in Commerzbank. He has a great attitude to work and is passionate about the job he does. Jon is always willing to help others and would be an asset to any team. He can be relied on implicitly in the tough times to always step up and give 110%. I don’t hesitate in recommending him and hope we get the chance to work together again. I worked with Jon during an ambitious storage tech refresh project with very aggressive timescales, and found him to be a consummate professional. Not only does Jon possess an unparalleled depth of technical knowledge in his own specialist area, he also has an outstanding working knowledge of the breadth of the IT infrastructure environment as well as an incredible ability to understand new technologies in a very short space of time. Jon is also one of the most amiable and easy to-get-on with individuals I have had the pleasure of working with, and would be an exceptional asset to any organization. Jon is one of the most talented administrators I have worked with. He’s technically very strong and combined with his attention to detail, professional attitude and personal qualities, he’s somebody I’m looking forward to working with in the future should the possibility arise. Over the years in my role as a consulting engineer working in the same company as Jon, I’ve been very fortunate to have released a lot of infrastructure into production status in collaboration with him. Jon has been able to adapt well to operating many different systems effectively, and has regularly contributed operations experience into project design and execution phases. Specifically, in recent years, Jon has been primarily responsible for running VMware infrastructure in a demanding London-based banking environment, including additional responsibilities in some international trading locations. 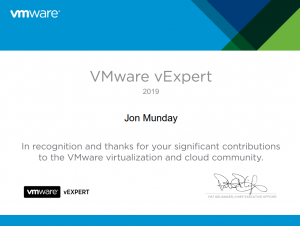 Jon has been instrumental in driving the use of virtualisation technology forward, in parallel gaining recognition and accreditation in the vendor marketplace as a VMware vExpert. In order to be successful in his role, Jon had to work at a very technical level on associated topics like storage and networking, where attention to detail is paramount. One of the most rewarding aspects about working with Jon is that he is quick to learn, and immediately engages critically with the topic at hand. He questions appropriately, and demonstrates an ability to evaluate whether a specific technology will introduce additional complexity or refine a solution. This ability is vital when dealing with complex systems. Indeed, because of the transparent and thoughtful manner in which Jon works, he has taken more and more responsibility for engineering topics, freeing up valuable engineering time for his colleagues. On a more personal note, Jon has a great attitude to work and is passionate about the job he does. He is willing to help others and will be an asset to any team. He can be relied on implicitly to step up and do what is required to ensure production service is maintained. It’s a pleasure to recommend Jon and I’m looking forward to working with him again in future should the opportunity arise. Jon is one of the rare professionals combining excellent technical knowledge with highly developed social competence. He is able to quickly understand new topics and stays focused on the targets to be achieved. Having discussions with Jon is a pleasure as he is able to listen and to explain his point of view in a logical manner. Jon’s mind is free for different opinions and suggestions he makes often broaden the partners view on topics. If you need somebody with his technical expertise you can totally rely on, he definitely is one of the best colleagues I’ve ever worked with in more than 16 years now. I had the pleasure working with Jon at Commerzbank. What struck me about Jon, was his friendly mannerism and professional approach to his work, always willing to help and provide the best possible service. Jon built a strong relationship with my team colleagues (Network Infrastructure). I have no hesitation in recommending Jon and wish him the very best. From the trivial to the complex Jon’s Window Server and VMware virtualization knowledge makes him the guy to seek out. Approachable and reliable Jon is an asset to any Windows Server Infrastructure team. Jon is possibly the most technically competent individual I have ever worked with – he is in a different league when it comes to his understanding of VMware, and his general ability to grasp technical concepts incredibly quickly. In addition to being a technical genius, he is a great member of the team and working with Jon was a pleasure. Jon is extremely technically proficient, particularly in VMware, but is also a team player with a friendly, approachable nature. Together these attributes made him a valued colleague and an asset to the bank. He will be missed. Jon is an excellent person to have on your team. He understands complicated issues and is able to articulate clear solutions. I worked with Jon on a number of specific projects in infrastructure. He is very strong technically. Jon is my go-to IT Infrastructure guy. He is the IT guy I’d try to hire if I was setting up my own business. Jon makes the effort to understand the technology behind every system in the bank, and how these systems fit together. He comes up with solutions when everyone else is giving you excuses. I worked with Jon for 2 years and I was really impressed with his knowledge and enthusiasm. One of the things that really stood out about Jon was that with all the knowledge he had, he was willing to share and help the others in the team, even when he was really busy. He is a great team player and a real asset to the team. VMWare migration: HDS to EMC VMAX. VMWare migration: HDS to NetApp Metrocluster. 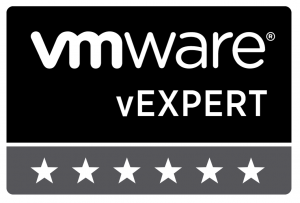 Jon was very knowledgeable of the VMWare environment and extremely thorough with test results providing strong arguments for why we should and shouldn’t adopt certain technologies. During the migrations Jon was always available per schedule and went over and beyond what was required of the team to get the VMWare environment on to the new technology ASAP. Away from the above projects, Jon provided excellent support for any issues and tasks that were required as part of the day to day running of VMWare and many Windows tasks and I found him to be an excellent colleague within the team to work with. I would definitely like to work with Jon again and can only imagine that he would make any IT team that much better and stronger. I cooperate with Jon on few projects. He is very smart with strong technical background. It was pleasure for me to work with him. I have had the privilege of working alongside Jon for the past 9 years and gained a vast amount of knowledge from him. He is a very talented individual who is exceedingly knowledgeable both technically and professionally. Jon also has a profound willingness to share his knowledge and teach others. Due to his calm demeanor, Jon has the ability to handle difficult situations with the utmost professionalism and ultimately, gets the job done properly every time. He has an outstanding rapport with those around him and is highly respected among his peers. Jon has my highest recommendation and would be a tremendous asset to any organisation. I worked with Jon for around 14 months at Commerzbank in London. He is a very knowledgeable Windows administrator and enthusiastic VMWare expert. I have found Jon to be very reliable and always happy to put in the extra effort to ensure that virtual infrastructure is maintained properly following industry standards and vendor best practice. Jon always makes himself available to help others in the team with Windows and VMWare tasks and is an asset to the team he works in. I would have no worries with recommending him to prospective employers and expect him to fit in really well in any team. I have worked with Jon for 12-13 years. Jon is reliable, has a high level of attention to detail and is technically first class. He is a team player, and always available for advice and help to his colleagues. He is always prepared to go that extra mile to ensure a job is done to the highest standard. Passionate about his work, he will accept new challenges, and ensure that he is immediately up to speed. Jon has been a massive influence on my career, and I have learnt from him in many ways, technically and in working style. Put simply any team would be enhanced immeasurably with Jon in it. I have worked with Jon for the last ten years and can highly recommend him as both technically very competent and a very quick learner. He also has a fantastic attitude, regularly going above and beyond for the company. He would be an asset to any IT department. Jon’s knowledge of Windows and VMware is extensive. His approach at work is extremely professional and helpful. I consider Jon a very valuable asset for our company. Jon has great wealth of knowledge in Windows, networking and IT in general. He is an articulate communicator and works extremely hard to deliver solutions on time. I’ve worked with Jon for a number years in different Windows related projects and he never failed to deliver solutions to complex problems. I have been impressed by his thorough, creative approach of his work and always go out of his way to provide answers to difficult questions with correct, in-depth, expert advice. Jon is a great asset to any IT team, 110% for sure!